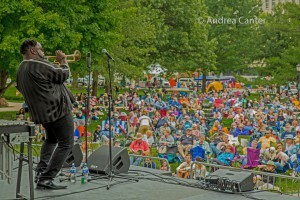 I think this was my 9th Iowa City Jazz Festival in the past 15 years. It’s a regular part of my summer routine now so I expect there will be nine more in the next nine years. 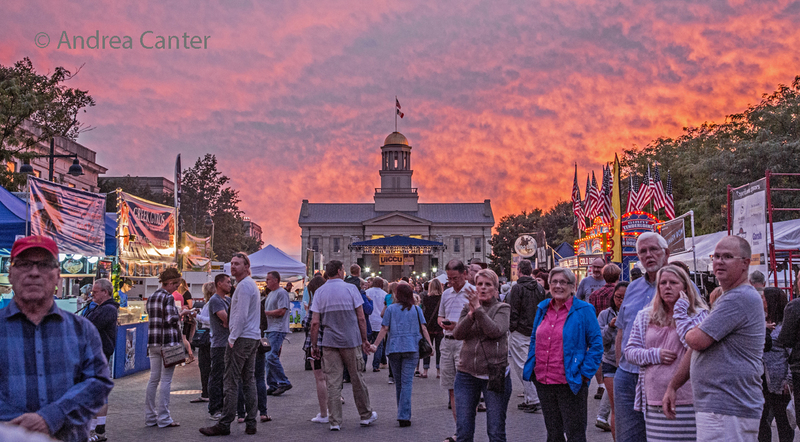 For Iowa City, home of the University of Iowa and its ideal festival setting on the “Pentacrest” lawn, it was number 26, and since that first little fest in 1991, the event has grown in both size and stature to earn accolades as one of the top festivals in the nation, and surely one of the very best festivals outside a major metro area. And it’s always free. The 2015 festival featured such talented headliners (Charles Lloyd, Rudresh Mahanthappa, Dave Douglas, Julian Lage), it was hard to imagine a similar level of incendiary talents for 2016. 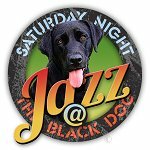 Kudos to the selection committee for again assembling not only world class talent across the three-day weekend, but for again bringing a diverse slate of music that covers broad definition of jazz without bending to the current trend of adding pop, rock and soul artists in an effort to expand the festival audience. 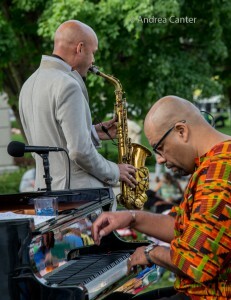 Iowa City manages to attract a wide audience with jazz alone with its well-considered programming– something for everyone (piano and organ trios, Latin big band, inventive modern ensembles, Colombian harp) with careful attention (within the confines of artists’ schedules) to sequencing bands on the Main Stage. 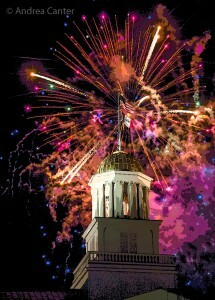 Even the city fireworks display was well-timed as a festival finale. 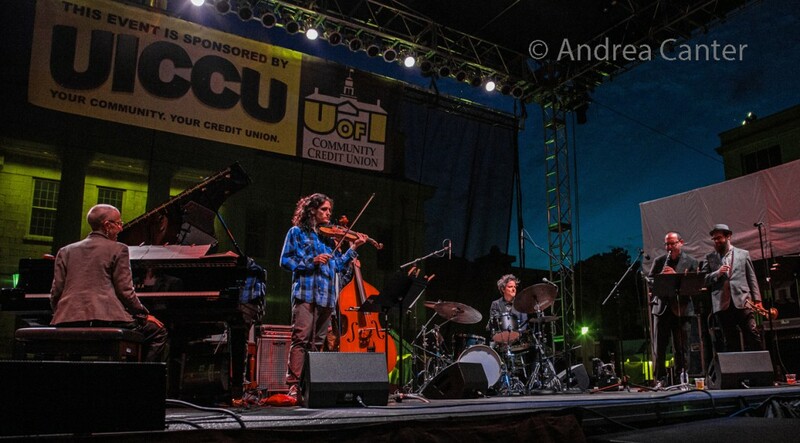 One of my favorite features of the Iowa City Jazz Festival is no-compete scheduling of headliners–each has his or her set on the Main Stage with no conflicting music. In-between sets on the Main Stage, there are three side stages, each boasting a Youth, College or Local band that plays 30-minute sets twice, making it very easy to hear absolutely every band on the schedule for all or most of a set. Those side stages are about a half block apart, just far enough to avoid sound bleeding and close enough to make it easy to go from one to another. I had never even heard of organist Akiko Tsuraga, but her trio had familiar names– young guitarist Graham Dechter and veteran all-star drummer Jeff Hamilton. But it was Akiko herself who commanded the most attention with her fervent swing through mostly standards, and her interactions with Dechter and Hamilton spelled collegial joy. 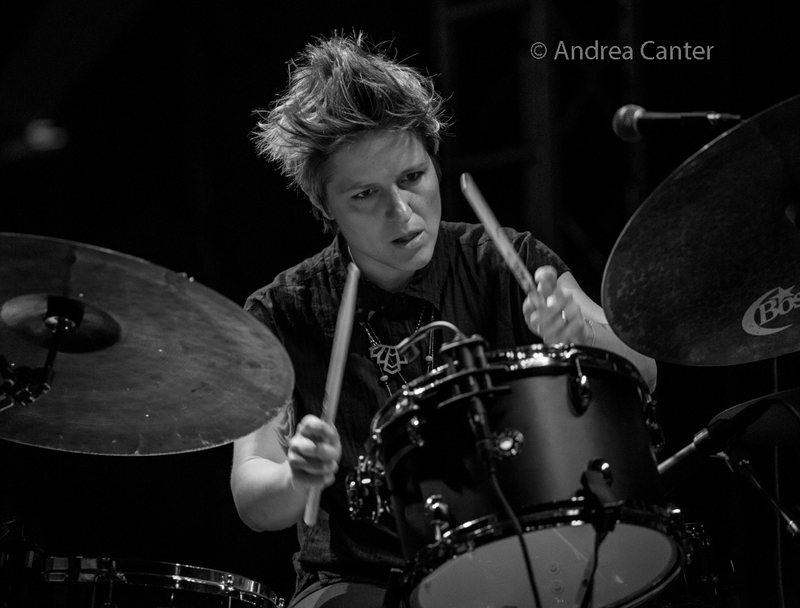 It was women bandleader night as drummer Alison Miller closed the first night with her Boom-Tic-Boom ensemble, featuring some of the standout artists on modern jazz scene, from pianist Myra Melford to violinist Jenny Scheinman, from bassist Todd Sickafoose (on a one-night loan from the Ani DiFranco tour) to clarinetist Ben Goldberg and trumpeter Kirk Knuffke. Original music prevailed as well as soaring solos. Goldberg brought along his contra alto clarinet which added some visual as well as aural excitement. Miller might be one of the most under-rated drummers in modern jazz, perhaps more widely acclaimed as bandleader and composer. She can turn that kit inside out. A very cool addition to the ICJF, and to the Twin Cities Jazz festival 300 miles north and one weekend earlier, is the Iowa-Minnesota Exchange launched in 2015. Each festival identifies a local band to send to the other’s festival; and the exchange extends to the Youth Stages, where the current edition of the high school “all-star” Dakota Combo represents Minnesota in Iowa City, and a selected Iowa City-area high school band goes up to perform on the Twin Cities Jazz Fest Youth Showcase. 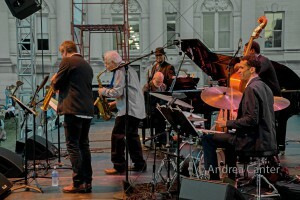 The Exchange was again a big success in 2016, as the veteran masters of the Phil Hey Quartet played an afternoon set on the Iowa City Main Stage, a week after the Iowa City-birthed Koplant No quartet had appeared at the Twin Cities Festival. Hey’s quartet is heard too infrequently in Minnesota and it was a treat to hear them in an outdoor context, having at least as much fun playing as we did listening. 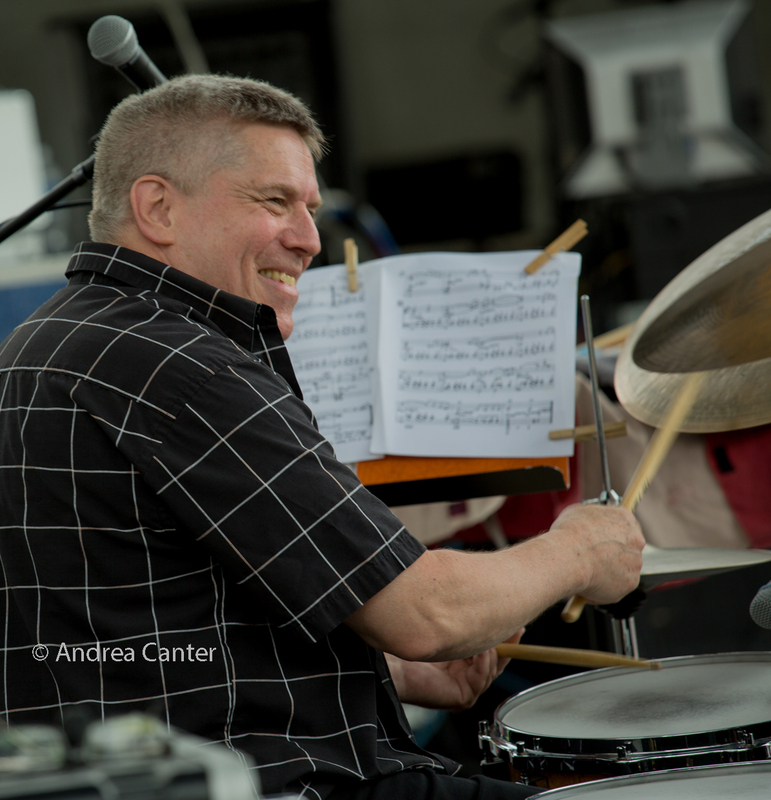 In addition to drummer Hey, the PHQ includes frequent Iowa City festival visitor Dave Hagedorn on vibes, Tom Lewis on bass and Phil Aaron on piano. 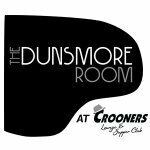 Their playbook includes tunes from Ornette Coleman, Frank Kimbrough, John Coltrane and more. Maybe the vibes just sound so natural when the tones catch the breeze! The Youth Stage was Minnesota-driven all day. Not only did the Dakota Combo play two outstanding back-to-back sets in the evening, but a Twin Cities guitar duo–Will Schmid and Adam Astrup-– tore that stage apart with two star-quality sets early afternoon, followed by their expanded Quartet playing two sets late afternoon. 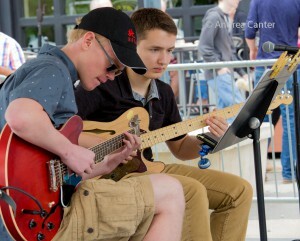 Astrup was thus on stage the entire day as he handled guitar duties for the Dakota Combo in the evening. In fact, over the six sets on the Youth Stage on Saturday, eight Minnesota teens made up the three bands. They would have given the college bands down the street a run for their money. What’s particularly noteworthy about these young artists is the nature of their repertoires– not the usual high school standards but works from modern giants as well as a good helping of original music. 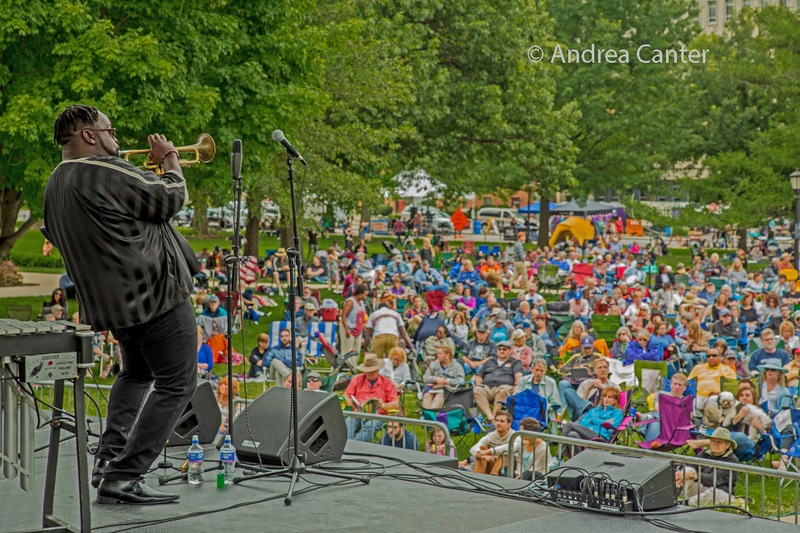 More action on the Main Stage: Marquis Hill, who first performed in Iowa City as a teenager with a high school ensemble from Chicago, won the 2014 Thelonious Monk International Trumpet Competition, and was on tour with his Black-Tet band. 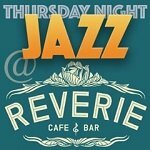 And it’s a band of top up-and-comers, including saxophonist Chris McBride, vibraphonist Justin Thomas, bassist Jeremiah Hunt, and star-in-the-making drummer Makaya Craven. Original works and more, the high-energy band was perfectly placed between the more sublime Phil Hey Quartet and Vijay Iyer Trio, like a seventh-inning stretch. Hill is enroute to a career as one of the outstanding trumpeters in the second century of jazz. 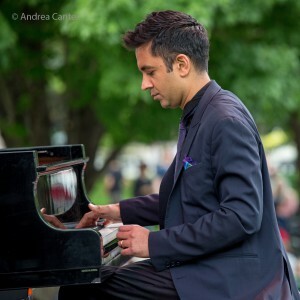 And then of course the Vijay Iyer Trio, arguably the top draw among serious jazz listeners and hopefully an accessible, pleasing introduction for the uninitiated to the clever and artful music of the poll-topping MacArthur “genius” award recipient. 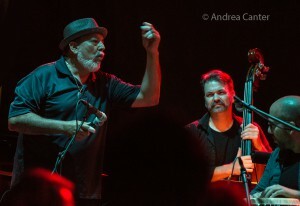 His collaborators– bassist Stephen Crump and one-to-watch drummer Tyshawn Sorey–are as responsible for the trio’s success as is the pianist leader, sharing composition credits and all together functioning like a telepathic unit that understands each others moves, as unpredictable as they seem. The music varies between playful and elegant. From the abstract inventions of Vijay Iyer, it was a joyful leap to the Latin percussion of Poncho Sanchez and his Latin Band, closing Saturday night with crowd-pleasing samba and jalapeno infused salsa rhythms, generating dance invitations among the crowd as Sanchez demonstrated his “the hands are quicker than the eye” routines and his bandmates on horns and percussion were similarly in a party mood. It was indeed a prelude to the fireworks set for the final day. The final day was bookended by piano jazz titans Larry Fuller (Trio) and David Berkman (Sextet). 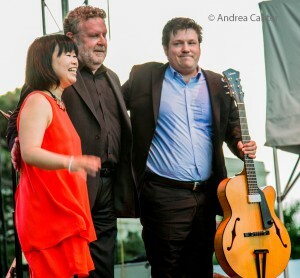 Fuller is a well-respected if not all that well known veteran pianist, a long-time member of the John Pizzarelli Quartet now spending much of his time in a leading role as performer and composer. With the bass-drum team of young bassist Katie Thiroux and (fiance) drummer Matt Wittick, Fuller presented a master class in swinging improvisation, drawing a good crowd for mid-afternoon. Fuller was followed by the most unique band of the weekend, the Edmar Castaneda Trio — Castaneda on Colombian harp with trombone and drums. This was by far the most exciting visual experience of the festival, particularly for those of us close to the stage. 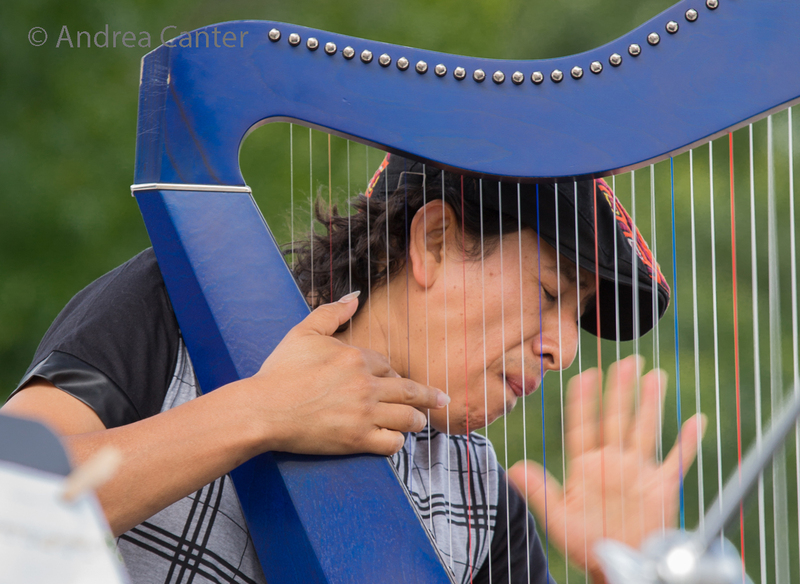 The Colombian harp is smaller than the classical harp, and Castaneda was gracefully energetic as he approached the strings from different angles, drawing out an orchestra of sound. The configuration of harp, trombone and drums seemed odd at first but the music– much of it centered on Latin rhythms–proved to be an infectious melange of sound that melded well to the visual presentation. 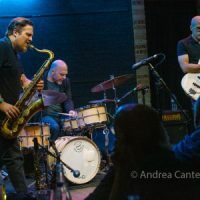 There was a clear Latin edge to the music of the Miguel Zenon Quartet, but that edge contained the post-bop core across a set delivered by ferocious improvisers– tenor saxophonist Zenon, pianist Luis Perdamo, bassist Hans Glawischnig, and drummer Henry Cole. Where Poncho Sanchez had created a dance party, Zenon created a mini symphony. Given the energy of Saturday night’s closing set, Sunday was rather anti-climatic. 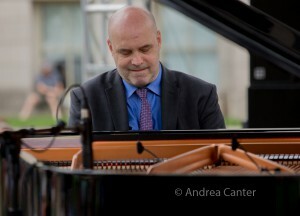 Pianist David Berkman was back for a long-awaited repeat, after a downpour during the 2004 festival washed out much of his set. 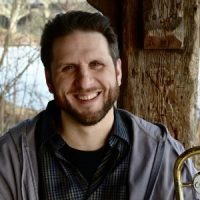 ‘ve heard Berkman in a quartet setting recently, and his immense skills at the keyboard seemed lost in the sextet, despite some terrific harmonizing among the saxes (Adam Kolker, Billy Drewes and Dayna Stephens). 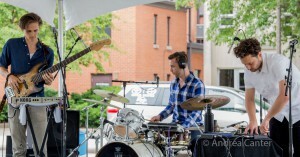 Bassist Vicente Archer and drummer Adam Cruz added admirably to the mix. 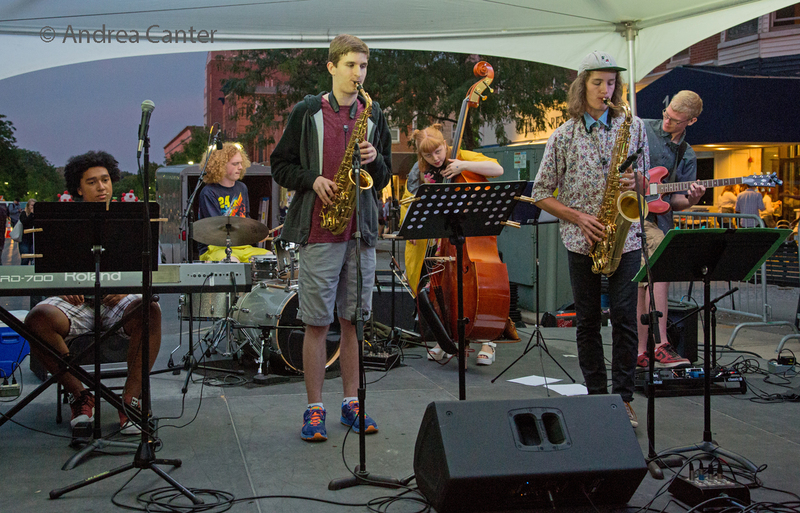 It was a fine set, particularly given that these six musicians had not played as one ensemble prior to coming to Iowa City, but it did not seem like the best choice to end the festival. Sometimes less (Zenon’s quartet?) is more. The following fireworks, however, did seem to bring the festival to a fitting end. More side stage delights over the weekend: On the College Stage, Junior Ranger, a band of four spring graduates of Oberlin Conservatory making their way from Midwest to East; half the band, trumpeter Joe Suihkonen and drummer Emerson Hunton, are graduates of Minneapolis South High, and had been in Minneapolis just a few days earlier (July 1); Jarrett Purdy and his band on the College Stage– Jarrett led the Iowa City youth ensemble on the Twin Cities Jazz Fest Youth Showcase in 2015 (July 2); Iowa City festival founding father and guitarist Steve Grismore with his trio on the Local Stage (July 1) and with Three Dawgs and a Bone on the College Stage (July 3); and the trio of two Koplant No veterans, Jack Lion, on the Local Stage (July 3), not long after their Twin Cities debut. 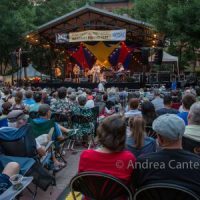 The Iowa City Jazz Festival is held on the first weekend of July — in 2017, those dates will be June 30-July 2. All the fireworks will have to come from the music as the city won’t have its annual display until the 4th. 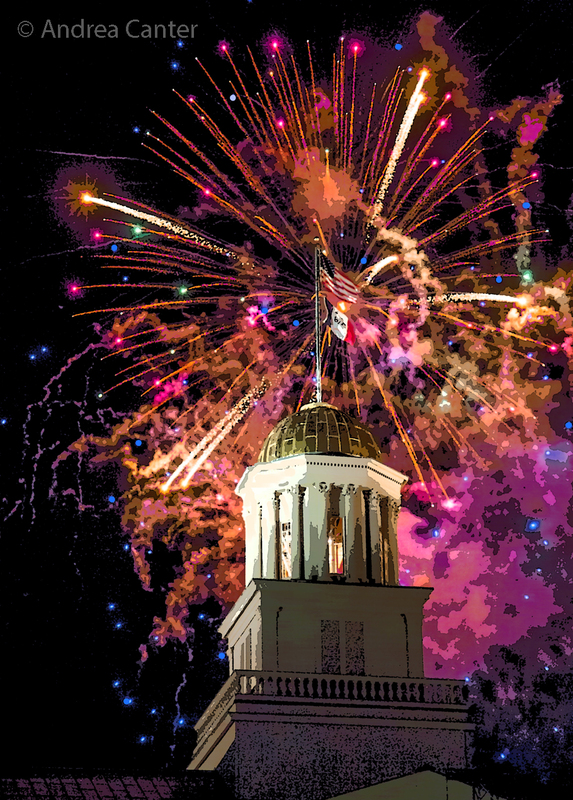 But I have no doubt that there will be more than enough hot talent on the Pentacrest to ignite one of America’s best celebrations of jazz. More about the Iowa City Jazz Festival at www.summerofthearts.org/.